Dark Moonlighting (Volume 1) - Kindle edition by Scott Haworth. Literature & Fiction Kindle eBooks @ Amazon.com. NickWhittier is highly accomplished and hard working for a 26-year-old; but then,he's been 26 for 651 years. As the witty protagonist in this well-paced comedyset in Starside, Ill., he is the vampire you hate to love... Morefunny than grisly, this clever novel offers a re-imagining of vampire cultureand the science behind it. 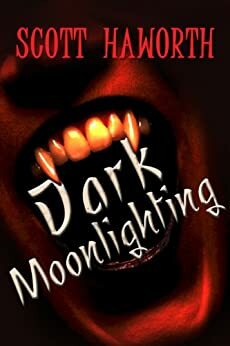 Deftly crafted and packed with action, gore, and just the right amount of laughs, Dark Moonlighting is an exceptional read due to the author's treatment of the overall subject matter. Nowadays, the key to getting valid mileage out of the well-worn vampire mythology is to rewrite or readdress the myths themselves. Treating vampirism as a virus-induced condition is innovative, and allows Haworth's distillation of the myths to be a predominantly physiological one. The book offers just the right amount of blood, seductiveness, and self-effacing angst, but the retooling of the mythology will definitely appeal to the more erudite and demanding vampire aficionados. 4.0 out of 5 starsLove Vampires but Hate Twilight? Don't Take Yourself Too Seriously? What if vampirism was caused by a good old fashioned virus? In that case, they wouldn't be demons, or demon possessed, and crosses and holy water wouldn't work on them. They'd be able to see their reflections just fine, but they wouldn't be able to shape-shift. That's exactly the scenario postulated by Dark Moonlighting, a humorous story of a 600-year-old vampire trying to make it in the modern world. He only needs two hours sleep a night, so to pass the time, he works three different jobs. I really enjoyed this book. It's funny, almost in the style of the Fat Vampire series by Johnny B. Truant, but it's not nearly as silly. The writing is polished and the plot is fast-paced, but never too much. And there's lots of humour... although it took me a while to "get" the names of Nick's nemesis' henchwomen, once I did I couldn't stop laughing! The ending's not really a cliffhanger, but it does pave the way nicely for the sequel. Which is definitely going on my to-read shelf. If you like vampires, but hate Twilight, and you don't feel the need to take yourself too seriously, this is the book for you. 5.0 out of 5 starsEntertaining read! Well written (there were a couple grammatical errors, but nothing to get bent out of shape over). The references to pop culture were hilarious, especially referencing Bones (Dr. Kenner and Agent Table). If you don't watch procedural shows or know the Kardashians, there will be some jokes that will go over your head. However, it is not going to ruin the story for you. I found myself laughing out loud more than once and it was very difficult to put the book down. I would've had it finished the same or next day if I hadn't had other stuff to do! Definitely looking forward to continuing the series! I'd also like to check out some more of the author's work because his writing style is right up my alley. So what are you waiting for? Quit reading my review and get to the book! 4.0 out of 5 starsDark Moonlighting is filled with dark humor, sharp teeth, a couple of bad guys, and clichés. Dark Moonlighting is filled with dark humor, sharp teeth, a couple of bad guys, and clichés. Nick writes his account as he's trapped with mocking officers in jail, awaiting his trial for a murder he didn't commit. He is also a 600 year old vampire who defies the shiny, angst-ridden vampires that swamp the market today. His face is marked from past disease, he has (often funny) secrets, and morals... somewhere. He keeps busy by flying between his three jobs of cop, doc, and lawyer. He maintains three identities and juggles trying to fool the general populace and a genius neighbor who gets too close to the truth later in the book. His life spirals hilariously out of control after a power hungry, cheesy enemy from his past and his three sidekicks show up in town. He develops two very different love interests and manages to whack an email spammer and persistent pamphlet pusher. (Don't lie to yourself- we all have one of "those" people in our lives we wish some 600 year old vamp' would come and mysteriously make disappear). Soon all three jobs are in turmoil due to interference from his newly arrived enemies and Nick's poor judgments. His life starts to unravel, the bodies pile up, and he has to face the reality his choices mean life and death for those he cares about. A quirky and easy indie read. Note: I received a copy of this book from the author in return for an honest review. This did not affect my opinion in any way. I really enjoyed this story and look forward to reading more from this author (and reading more of this character from "Dark Moonlighting"). This was a very unexpected and enjoyable twist (of sorts) for a "vampire" type read. I enjoy reading everything regarding the monsters in life and the way this was written made being a vampire a bit more.....well realistic in a sense. I like how it was written from the character's prospective and that even though he knew of his descresions and seemed to have some guilt (which you don't typically read in vampire stories)he seemed to work hard to be a part of regular society and took on jobs that were smart and tough. I like that this paticular vampire did not have a self image of absolute beauty and even those around him saw obvious flaws. I like that he loved and owned a cat (over the centuries) I thought that made him more likable and gave him an even bigger value to his character (it shows he could care about something/someone and not just himself and bloodlust). This was a fun and exciting book to read and it was very difficult for me to put it down. Even though you were aware of his many transgressions you wanted to see him come out of this okay (at least I did). I am glad to see at the end of the book that there will be another coming soon and look forward to reading it. I believe the author did a wonderful job of capturing and holding the readers attention, giving us diversity in a genre that we obviously all love without mocking it or making it sappy and disgusting. There was enough action, mystery, drama, and even comedy that made this book all around a lot of fun to read for me. Like I said an unexpected vampire in every way.